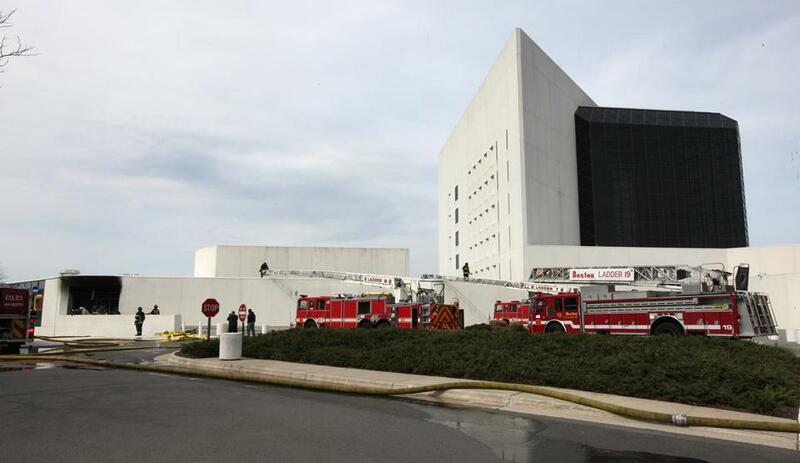 The fire at the JFK Presidential Library and Museum caused some damage to the exterior of the building (far left), blackening the area of what appeared to be a side entrance and shattering some windows. Inside, damage was caused mostly by smoke and water and not that much from the fire itself. A fire and possible explosion Monday afternoon at the JFK Presidential Library and Museum prompted a full-scale investigation by local, state, and federal authorities to determine whether the incidents were linked to the deadly Boston Marathon blasts. The fire broke out shortly before 3 p.m. — around the same time as the Marathon explosions several miles away — in an HVAC system in a section of the complex opened in 2011 that houses offices, a classroom, and some archival material, said Rachel Flor, a library spokeswoman. Everyone evacuated the building in Dorchester safely and no injuries were reported, she said. Thomas Putnam, the library’s director, told reporters around 4 p.m. that a bomb squad was coming in as a precautionary measure in light of the Marathon blasts. Shortly afterward, Boston police and State Police cars swarmed the library parking lot, along with authorities from the US Secret Service and the federal Bureau of Alcohol, Tobacco, Firearms and Explosives. They ordered all employees and visitors off the property, as they conducted a full sweep for bombs. Concern about a possible connection to the Back Bay explosions escalated in the afternoon when police Commissioner Edward F. Davis said during a televised press briefing there had been a possible explosion and a possible incendiary device at the library. That caused reporters to flock to the library. But by evening, Davis appeared to back away from his earlier statement, saying only that authorities were investigating at the scene. “The preliminary investigation indicates the JFK incident may not have been an explosion. It may have been a fire,” Davis said. The fire caused some damage to the exterior of the building. It blackened the area of what appeared to be a side entrance and the windows were shattered. Inside, damage was caused mostly by smoke and water and not that much from the fire itself. “We don’t anticipate damage to the collections,” Putnam said. Once outside, he said he saw a couple of people trying to put out small flames with extinguishers. But then the flames abruptly grew very large and the smoke turned from white to black. Benton compared the sudden escalation to the lighting of a barbecue grill. “Suddenly, a big whoosh,” he said.